Designing a cartridge is not something I have personally contemplated though I have studied them in some detail. Mainly looking at how they interact with and transmit energy to the tonearm. Your brief description sounds like you are not using a cantilever. I think that Decca made several cartridges like this. As your cartridge is mechanical (it uses a physical stylus) it will still have to have a suspension of a certain compliance. Coupled with the damping you mention and the mass of the cartridge body/arm effective mass this will create a spring-mass-damper system the same as any other cartridge. This will still result in a transfer of energy to the tonearm. This is unavoidable in a mechanical system unless the cartridge is decoupled from the tonearm. Decoupling the cartridge creates another spring-mass-damper system between the cartridge and arm with its own resonant frequency. This would have to be below the audio bandwidth in order not to place a resonance in the audio bandwidth. Decoupling a cartridge in this way is difficult to implement and counterproductive. Oops run out of time to write more right now. You are right, a bearing is much better. So I have made a bearing from a low voltage connector and a stainless spoke. See this picture. The short peace of the spoke is glued into the outer tonearm tube. It is difficult indeed. But I will give it a try. Maybe in January. Got cut short in my last post. Virtually all commercially available cartridges have bodies that are made of a rigid material that usually also have good self damping properties. The aim of these bodies is to couple the generator as solidly as possible to the tonearm without allowing any unwanted resonances between the two. There are several aftermarket cartridge decoupling devices available. In certain circumstances where there is a mismatch between arm and cartridge or a particularly lively arm they may be beneficial. They will definitely make the sound different but not normally better. Cartridge manufacturers put a lot of work into developing their products. If decoupling of the cartridge was beneficial it would be built into the cartridge. Re your post that arrived between the two parts of mine. Definitely have a go at making a cartridge you might have a game changer. It's something that is way beyond my capabilities. Last edited by niffy; 17th December 2016 at 11:50 AM. It is way beyond my capacities too if the cartridge is identical to a traditional MC cartridge. Fortunately it is quite different. The most difficult job is the alignment of the stylus with the coils (100% symmetric). When this is perfect done, the channel separation of a phono cartridge can reach about 50 dB. Thus I have to find a trick to do this job in a controlled way (maybe with the help of a laser beam and magnifying mirrors). Binocular microscope under polarized light? A good binocular scope is expensive. Adapting the light source of your existing scope with the addition of a polarized filter shouldn't be very costly. By rotating the filter you should be able to find a setting that allows you to see the facets of the stylus more clearly than under non-polarized illumination. Thanks! A good idea, I give it a try! I think that Decca made several cartridges like this. As your cartridge is mechanical (it uses a physical stylus) it will still have to have a suspension of a certain compliance. Coupled with the damping you mention and the mass of the cartridge body/arm effective mass this will create a spring-mass-damper system the same as any other cartridge. In recent production, the newly introduced Audio Technical ART-1000 is similar. As you can see the coils are right above the stylus but it has a rather long cantilever from stylus to the suspension. I'm curious what material is the cantilever. 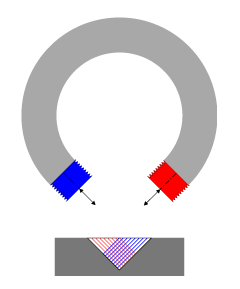 Reportedly it's very hard to make and only one person knows how to make the coils and install them properly. The amount of cool stuff you find never ceases to amaze me. My initial reaction was the same as the guy in the video, high tip mass and long cantilever, surly not. But as the coils are attached right at the stylus and not at the other end of the cantilever the negative effects should be alleviated. Nice find.